On Tuesday night I attended my first ever Rotary Club meeting as a guest of Pam Neaves (she who designs my book covers). I was absolutely blown away by a lady to whom a presentation was being made. 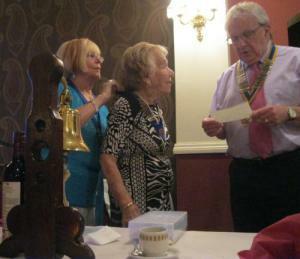 Lillian Hopkins at 97 is the oldest member of the women’s arm of the Rotary Club, known as Inner Wheel. Not only is she active in the Wylde Green branch of the Rotary Club, she still travels to South Africa every year to support a number of charities; and to top it all she was wearing a dress I quite fancied myself.